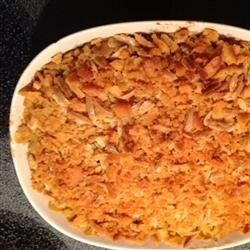 "A great casserole that everyone will love! It freezes well." In a medium bowl, mix white corn, green beans, celery, onion, pimento peppers, sour cream, Colby cheese, cream of celery soup, salt, and pepper. Transfer to a 1 1/2 quart casserole dish. Melt butter in a small saucepan over medium heat, and stir in slivered almonds and crushed crackers. Sprinkle over the casserole. Bake for 45 minutes in the preheated oven, or until bubbly and lightly browned. This casserole is excellent indeed, easy to put together and suitable as a side-dish to just about anything. I used chopped green onions instead of regular onion, and it came out wonderful. Different strokes for different folks. I absolutely loved this and my husband just thought it was okay. I made it exactly as the recipe states and it came out perfect. This has a distinct taste that you will either love or hate. My husband loved it, I thought it was okay. I made this for a covered dish supper and it was a hit. Followed the recipe as is. I've been trying to find this recipe after losing it after Thanksgiving last year. It was without a doubt the best green bean casserole I've ever had! All time favorite.